Teatro Massimo, houses just 4 super design rooms, but first of all, you can have a personalized concierge service provided by the owners. Palco Rooms&Suites boasts an enviable location, one of the most fascinating in Palermo. It is, indeed, placed in front of Teatro Massimo, the largest opera house in Italy and one of the biggest one in Europe. Within walking distance from the B&B, you can reach the city center and visit the main squares and monuments of Palermo. Among the places worth visiting are the historical markets of Palermo, Mondello and Cefalù beaches. The closest airport is the Falcone e Borsellino Airport (about 35 km). Palco Rooms&Suites is a B&B which can be described as a perfect example of style and design. Every detail, from the furniture to the curtains, are carefully chosen to ensure an exclusive and welcoming atmosphere. The common areas and the 4 rooms are bright and characterized by modern furniture and white minimal style. Each room provides air conditioning, Sommier bed, iHome clock radio system with docking station for Apple, Nespresso Coffee System, complimentary Wi-Fi connection, complimentary toiletries and several additional facilities. Standard Aida – 20 sq.m., bathroom with shower, balcony with Via Cavour view. Superior Boheme – 25 sq.m., double or twin, bathroom with shower, balcony with Via Cavour view. Exclusive Opera – 26 sq.m., double or twin, possibility of 3rd bed, bathroom with shower, balcony with view over the theater "Massimo". Suite Romeo&Juliet – 45 sq.m., bathroom with shower and Jacuzzi tub, living zone, two balcony with view over the theater "Massimo". Possibility to accommodate up to 4 people. The buffet breakfast is rigorously prepared with bio and local products. It is served at the dedicated room and consists of organic jams, cakes, croissants, pastries, cereals, fresh milk, Sicilian honey, yogurt and fresh fruit and the famous "granita" crushed ice drink, Sicilian orange juice and almond fresh milk. The Palco Rooms&Suites has not an own restaurant, however on request, it can organize a sushi dinner room service. The staff is glad to organize for you any kind of excursions or a guided tour to discover best the city and is at your disposal for any kind of information. Exclusive Suite, characterized by a modern and white minimal style and equipped with several modern comforts and special amenities. It can host 3 adults and a baby. The en-suite bathroom provides chromotherapy and aromatherapy shower, large Jacuzzi bathtub 180x100, hairdryer slippers and complimentary toiletries. The Romeo&Juliet Suite has two balconies, both with view over the theater Massimo. The Wi-Fi connection is complimentary. Characterized by a modern and white minimal style, the Exclusive Opera rooms offer both a welcoming and exclusive atmosphere. The bathroom has a shower with chromotherapy and aromatherapy, hairdryer and complimentary toiletries. All Exclusive Opera rooms have a balcony with view on the theater "Massimo". 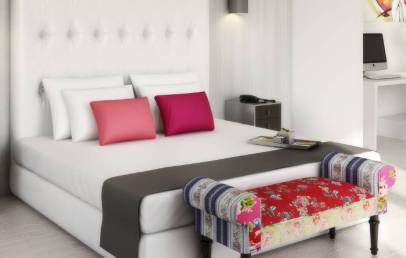 Characterized by a modern and white minimal style, the Superior Bohème rooms offer a welcoming and exclusive atmosphere. 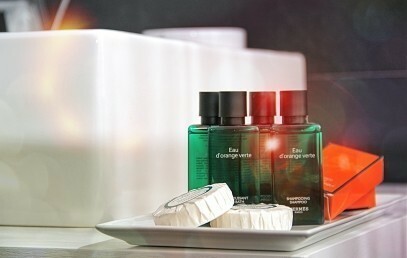 The bathroom provides shower with chromotherapy and aromatherapy, hairdryer and complimentary toiletries. All Superior rooms have a balcony with view over "Via Cavour". Characterized by a modern and white minimal style, the Standard rooms offer a welcoming and exclusive atmosphere. The en-suite bathroom provides shower with chromotherapy and aromatherapy, hairdryer and complimentary toiletries. All rooms have a balcony with view on "Via Cavour". Family Room characterized by a modern and white minimal style and equipped with several modern comforts and special amenities. The en-suite bathroom provides chromotherapy and aromatherapy shower, large Jacuzzi bathtub 180x100, hairdryer slippers and complimentary toiletries. It has two balconies, both with view over the theater Massimo. The Wi-Fi connection is complimentary. Advance Booking Rate Non refundable - Book at least 30 days in advance and get a 10% reduction on your stay. Last Minute Rate non refundable - Book from 3 days before the arrival and get a 10% reduction on your stay.